Ain’t easy being triangle, the nameless protagonist of Infinite pew pew. Stars, circles, diamonds and even Pac-Man shaped enemies are constantly on the assault, and you either dodge, shoot, or die. Simple as that. Power-ups, which spawn randomly, do help even the odds, but it’s still an uphill battle for survival. A flash and entertaining battle, but a battle nonetheless. 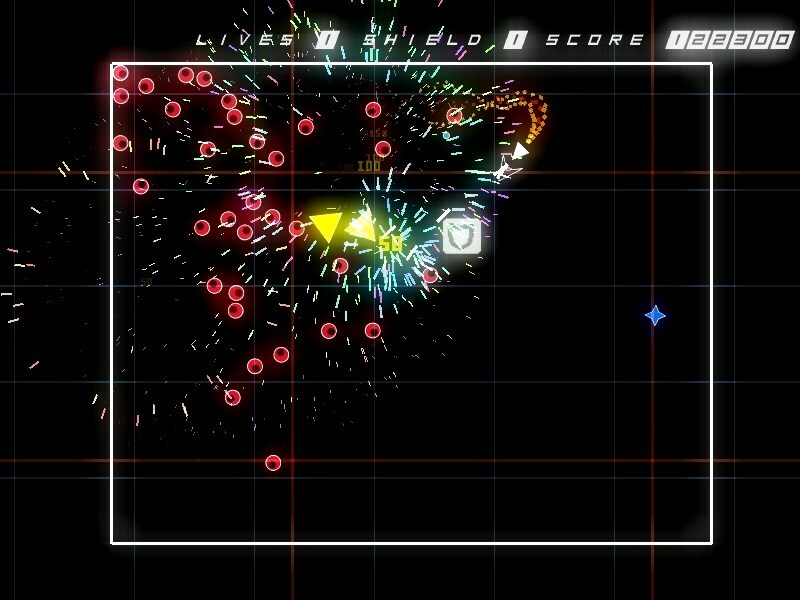 As I’m sure you’ve realized from that description and/or the above screenshot, Infinite pew pew is an arcade style twin stick shooter; one that bears an uncanny resemblance to Geometry Wars: Retro Evolved. That’s not to say it’s just another clone like so many other however, as it does feature a few interesting ideas to help keep a rather tired formula somewhat fresh. Somewhat. Now, the aforementioned power-ups are easily the main attraction here, as being able to ricochet shots off walls and spray bullets in a 360 degree arc certainly adds to the fun factor. The acquisition of ‘Amigos’, or attack drones, on the other hand, is more of a firepower addition than anything else. They are something you’re going to need once the game really gets going though, as it’s not long before enemies really start to swarm, approaching fast from all sides. Experience an intense gameplay, full of danger in every corner you go (or escape), that will boil your blood and augment your adrenaline with hordes of enemies while dodging bullets and surviving as long as you can on this geometric mayhem of massacre and destruction. Oh, your shields? Yeah, they’re not gonna last, so it’s a good thing that they can be replenished by way of pick-ups which – like everything else – spawns without rhyme or reason. But while extra firepower, different weaponry and ‘Amigos’ are all great, my personal favorite is definitely Badass Time! If only it didn’t slow time for your as well, ya know? That would probably be a bit ridiculous, I suppose, as you’re already able to move significantly faster than the enemies, and very few are able to even return fire. One can dream though. One can certainly dream. With a grand total of fourteen enemy types, it won’t be long until you’ve fought the entire lot, but is that really a bad thing? It is after all a score-based experience, so in a way, keeping it simple is – in my opinion – the best approach. Players don’t want to spend hours memorizing enemy patterns in a game like this, where setting a high score is the main objective. No, they want a fast-paced, fluid, fun pew pew, which… well, is pretty much what Infinite pew pew is. It’s also pay-what-you-want, so chances are you’ll at least get your money’s worth, ya know?